Final Fantasy IV is owned by Square Enix. One of the oldest RPGs to come out of the early 90s, Final Fantasy IV has long been considered a staple of the genre by its many fans. It follows the story of Cecil, a Dark Knight charged with collecting the elemental crystals of the world... by any means necessary. With a rotating party and a deeper plot than had been standard at the time, Final Fantasy IV proved to be a smash hit in Japan, and was released for the Super Nintendo in North America as Final Fantasy II. It has since been readapted to many different systems, and was given a significant dose of new content when rereleased for the Gameboy Advance, and then again for the Nintendo DS - in full 3D, no less. The popularity of Final Fantasy IV proved enduring enough that it eventually received a sequel, Final Fantasy IV: The After Years, in 2009. 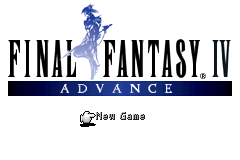 This walkthrough will follow the terminology used in the Gameboy Advance version of Final Fantasy IV, which carries over rather well to the upgraded PlayStation Portable version. For a full list of name changes between the versions, please consult this article on the Final Fantasy Wiki. Though there are obviously an awful lot of similarities between the two- and three-dimensional versions of Final Fantasy IV, this walkthrough is, by and large, not appropriate for the DS version of Final Fantasy IV. It can, however, be used to play any other version of the game with a reasonable degree of accuracy.